In a neighbourhood in downtown Sofia, theatregoers are looking for entertainment among the city's rubbish—quite literally. As night falls, spectators are led from one garbage bin to another, listening to the untold stories of the Bulgarian capital's army of unofficial refuse collectors. "You can tell a home by its rubbish. Show me people's rubbish and I can tell you who they are," says one actor dragging a cart, while another describes a collector's daily routine while sitting on top of a full garbage container. The unusual joint performance by environmental pressure group Za Zemiata and the Vox Populi documentary theatre group presents verbatim some of the accounts of the 5,000 or so people who eke out a living in Sofia's ever-growing rag-and-bone trade. Za Zemiata, in addition to combating the stigma that brands them "vagrants", also wants to highlight the crucial role these unofficial collectors play in helping Sofia meet an EU target of recycling 50 percent of its rubbish by 2020. Indeed, according to field studies by Za Zemiata, they handle between 70,000 and 100,000 tonnes of recyclables every year, accounting for between 41 and 57 percent of such material collected in the capital. Most of the collectors are middle-aged or elderly, with two-thirds of them working seven days a week, carrying huge loads on foot or with small makeshift carts, and earning less than 10 leva ($6/5 euros) a day. That amounts to a monthly income that comes close to Bulgaria's official poverty line of 321 leva. While collectors are happy to tell their stories, only a few agree to give their names or be filmed by journalists. One of them is former secretary Penka. At 63, she gets by collecting nylon and cardboard and handing it over to her local recycling depot in return for enough money to buy food for herself and her cats. 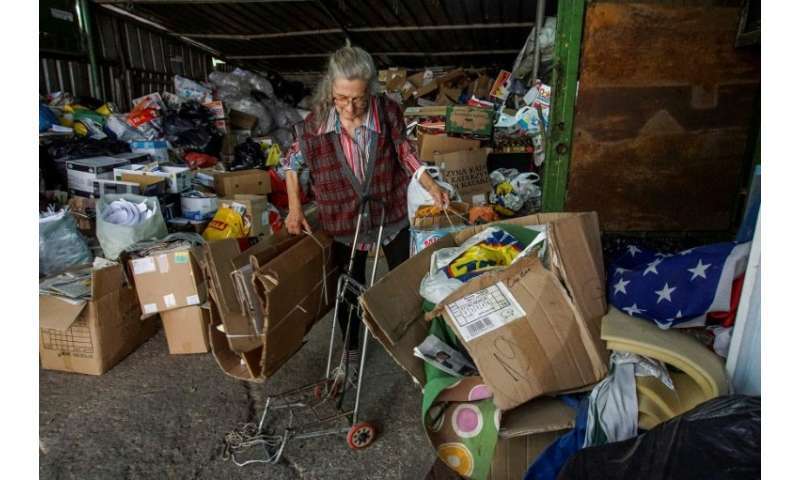 "Seven days a week, 2.50 leva (1.25 euros) per day makes around 20 leva per week but I am grateful," the haggard woman told AFP outside the depot, clutching her daily haul of coins in her hand. 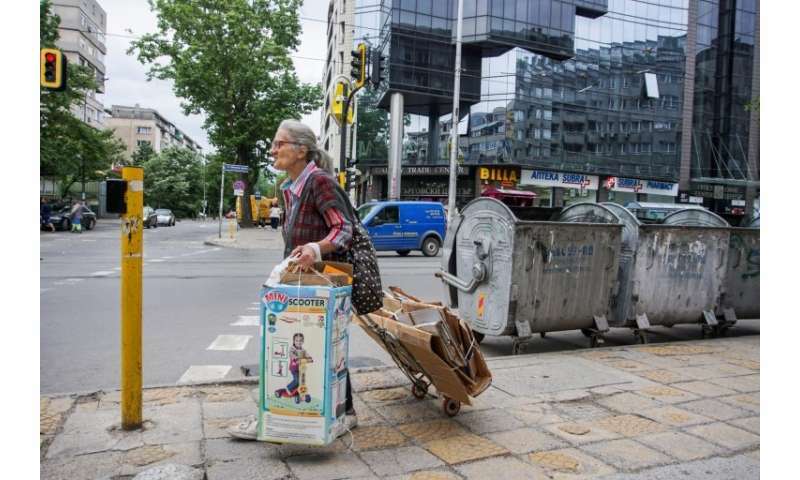 Near a rubbish container on a central boulevard, Boryana, 62, is also finding what she needs to make ends meet, carefully arranging bottles, cans and paper in separate sections of her small cart. "I am not a pensioner yet. My husband died, I have no children but somehow I don't want to die yet," she said. In recent years, people like Penka and Boryana have become a common sight in the capital of the EU's poorest member state. But according to Za Zemiata, they have remained largely invisible to the authorities and have often been unjustly vilified. "These people do what most of the others do not. Let us stop pretending they are not there," said Za Zemiata activist Evgenia Tasheva. A recent national poll showed that 68 percent of the population do not recycle—which is not obligatory in Bulgaria. Several schemes backed by city authorities to sort waste using different-coloured containers have also fallen flat, with the result that less than one-third of the city's waste is recycled. A further 16 percent of the city's rubbish ends up in landfill, while the rest is converted to fuel, with city authorities recently green-lighting a new power plant to burn it. Za Zemiata has protested against the plant, saying the authorities should focus instead on integrating collectors like Penka and Boryana into the waste disposal system as a way of boosting recycling. But any such move would likely face stiff opposition from the contractors who run the city's official recycling schemes and who accuse the unofficial collectors of "hindering" their work by rummaging through their bins. Za Zemiata has also raised the alarm over a recent official decision to move the depots where unofficial collectors hand in their materials to the outskirts of the city as of next year, citing complaints about pollution and noise. The organisation fears the decision could push collectors like Penka and Boryana even further into poverty. "We collect, separate like ants—to earn our living. But I think we are also doing good. If that ends, I'll put out a hand, if someone drops something in it..." a 60-year-old recycler shrugged as he turned in a huge pile of refuse paper to earn his wage for the day.